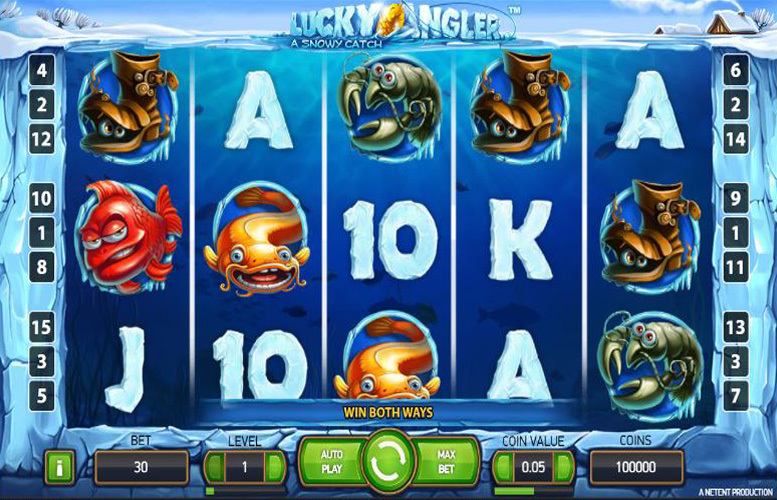 A fishing themed five reel and three row slot game, Lucky Angler has 15 pre-set paylines and a theoretical return to player percentage of 96.4%. Players can set one of ten different bet levels and one of six separate coin values to control their betting amount, and are likely to enjoy the game’s Sticky Wilds, Free Spins and innovative ‘Win Both Ways’ feature. If you’re considering choosing Lucky Angler as your newest slot game, you will want to know as much about it as you can before you start. That’s why we’ve put together this review which will explain the game’s top jackpot, its special symbols and features, the paytable and how you can control your wagering. 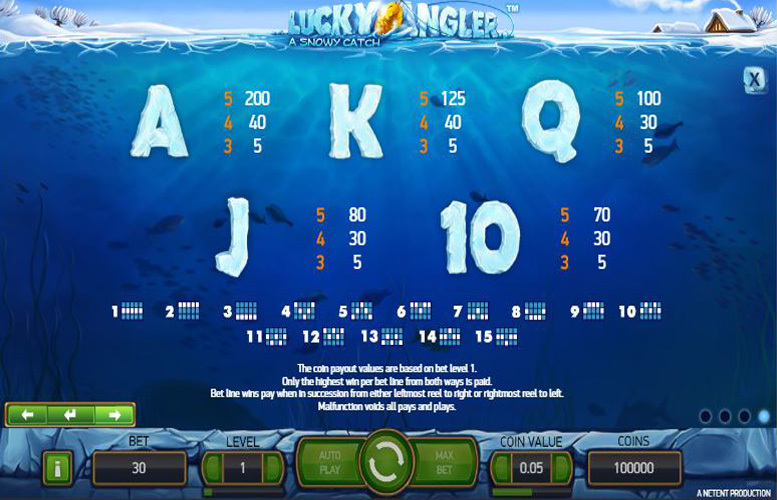 Lucky Angler has 15 pre-set paylines and as is the case with most slots, the biggest wins are achieved when five matching symbols are lined up along a payline. The most valuable symbol within the game is the large red fish symbol, which pays at a rate of 2000 times the bet level for the spin. That means that at bet level ten, a set of five of those symbols is worth 20,000 coins. This particular slot, however, also boasts a ‘Win Both Ways’ feature, which means that combinations can run from either left to right or from right to left. In the case of a five symbol combination, therefore, the win counts in both directions, meaning that five red fish symbols actually pay the top jackpot of 40,000 coins per payline. In currency terms, at the top coin value setting of 50p that equates to a top jackpot of £20,000 per payline. Most of the symbols found on the Lucky Angler reels are themed around the world of fishing but there are also a couple of special symbols. 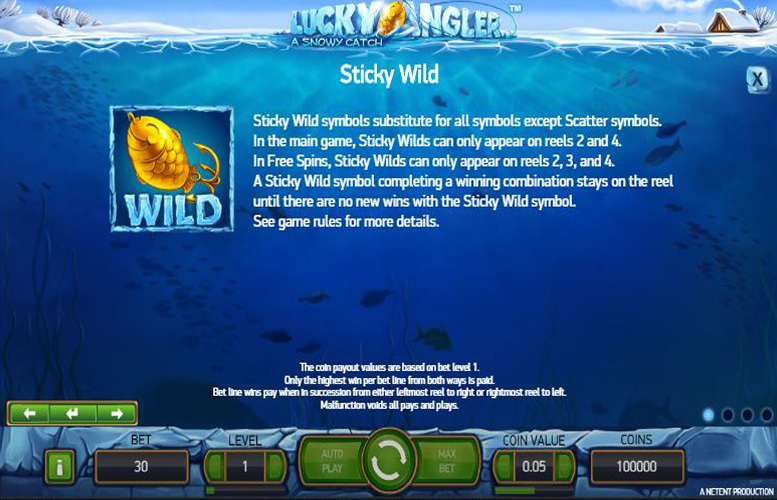 These are the Sticky Wild symbols and the Scatter symbols, and they both activate special features which can help players to boost their winnings. Sticky Wild Symbol – the Sticky Wild symbols can appear on either reel 2 or reel 4 during the main game and on reels 2, 3 or 4 during free spins. The symbols substitute for all other symbols apart from the Scatter, go towards making up the most valuable possible combination for a payline and if they form a winning combination, they stick in position until no new win involving the symbol is possible. During free spins, too, a Sticky Wild appears automatically on row two of reel 3 and stays for the duration of the free spins. 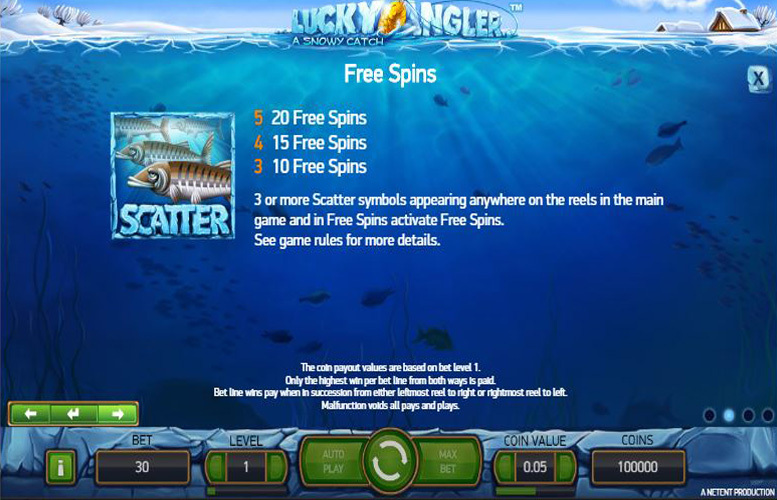 Scatter Symbol – scatter symbols within the Lucky Angler game are what trigger free spins and the number of Scatters which appear, determine how many free spins are activated. Three scatters result in ten free spins, four trigger 15 and five activate 20 free spins. All free spins are played at the same bet level and coin value as the spin which activated them and Scatter symbols are also present during free spins and can activate additional ones. Fish and fishing form the basis of the Lucky Angler game, and the most valuable symbols found on the reels are those depicting large fish of different colours. The most valuable of all is the large red fish symbol, which pays out at a rate of 2000 times the bet level. At the top bet level of ten, therefore, that results in a payout of 20,000 coins but as the ‘Win Both Ways’ feature is a key part of this game that can be multiplied by two. 40,000 coins, then, is the top payout offered per payline for the most valuable combination whilst the next biggest payout is an equally impressive 30,000 coins. That second largest jackpot results if a player lines up five of the second most valuable large orange fish symbols along one of the game’s 15 paylines. Setting the bet level and coin value is how Lucky Angler players can control their betting amount per spin. The coin value determines how much each coin wagered is worth and there are six options from 1p to 50p. Bet level, meanwhile, dictates how many coins are bet per spin and there are ten choices from 1-10, each of which being worth 30 coins. The minimum possible stake per spin, therefore, is a total of 30p which can be achieved by setting bet level one (30 coins) and a coin value of 1p. The maximum, on the other hand, is a full £150 which is reached by setting bet level ten (300 coins) and a coin value of 50p. 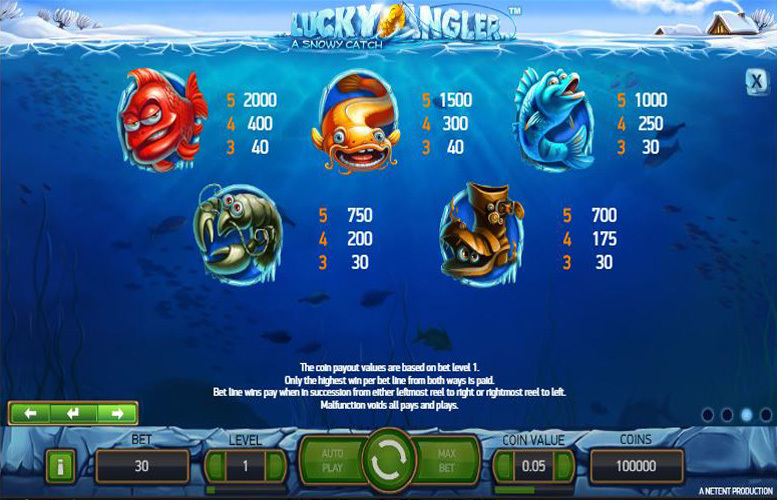 Lucky Angler is a traditional style slot game with a handful of interesting features and a reasonably generous top jackpot. The fishing theme is an original and fun one, and allows the game to introduce some attractive symbols and images. When it comes to features and bonuses, however, this slot falls a little short of many of its competitors. There are free spins offered but these have no multiplier or other special features applied and apart from the free spins, other special features are limited to simple Sticky Wilds. The game’s ‘Win Both Ways’ functionality, though, does add some extra interest and can prove to be lucrative for players, which at least partially makes up for the relative lack of other features. The comparatively generous top jackpot of 40,000 coins per line too, will help many players to overlook that paucity of features. This game has a rating of 3 / 5 with 538 total reviews by the users.